Having guests over for the holidays? 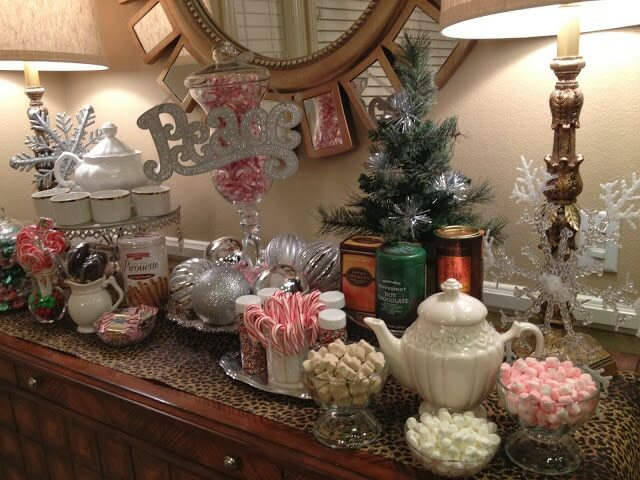 Set up a hot cocoa bar and your guests, young and old can enjoy a custom cup of hot cocoa. We set up a tea pot filled with warm milk, crystal bowls full of peppermint marshmallows, candy canes, whipped cream and festive sprinkles. The red and white peppermints and candy canes are such as easy and festive way to add holiday cheer. My clever friend Mindy from Mindy Laven Interiors set this up using cake stands to add height and dimension to table decor. Serve your hot cocoa with cookies and enjoy! Join me over on Pinterest here and see more of the great ideas I have shared to help you to decorate on a budget!